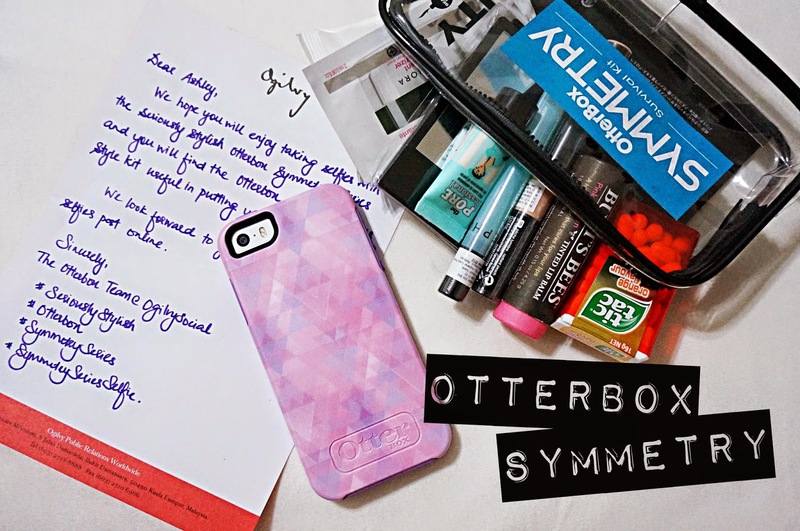 Like I've mentioned at the end of my previous post and my Instagram, I received a parcel in the mail on Monday, with an Otterbox phone case from the Symmetry collection for my iPhone, along with a good old-fashioned handwritten note from The Otterbox Team (love it!) and also a travel beauty kit (love it even more!). I've heard of Otterbox earlier this year when I was watching an American family's vlogs on YouTube, the mother was raving about her Otterbox case that prevents her baby daughters from accidentally destroying her phone while playing with it. And when I saw that, I was like "Otterbox? What the heck is that? ", did some Google-ing and found out it is a very popular choice of phone protection for the Americans and Canadians, but quickly forgot about it as it wasn't available in Malaysia. Oh but guess what, Otterbox has finally hit the Asian market and is available to all of us here in Malaysia through their website. The case I received is Dreamy Pink from the Symmetry series. The pattern is made out of tiny triangles with different shades of pink/violet that sort of forms an aztec-y print. Cute! And the front rubber bumper is a gorgeous shade of lavender which is one of my favourite colours, and every time I look at my phone, the colours just make me so happy. Pretty things really can light up your day. Most important requirement I have for all my phone cases is this. I hate cases with a flat front that only protects the back and doesn't have a beveled edge like this to protect the front, because the inconvenience of dropping your phone facedown and cracking the screen which is probably the most important feature of the phone is indeed dreadful. The phone case is made out of two different materials, where the lavender part is a synthetic rubber, ready to absorb the shock from a fall, giving your phone the maximum protection it deserves. Pros: I haven't dropped my phone, and I am definitely not planning to, to be able to judge its full potential. I'm quite a careful person, and sometimes it does get annoying because I'm always so anxious and uneasy, trying to be alert not to drop, break or lose something, and this case does get quite the load off my shoulders since I now don't have to worry (that much) about dropping and destroying my phone. This case isn't the slimmest in the market, but it is just the right amount of bulk, plus I put my phone in my bag, not my pocket, so the slight bulk really doesn't bother me one bit. It fits perfectly on my iPhone 5s, very easy to insert and remove. Cons: I only have 2 things to complain about really, one being the price and another one, the available designs. The retail price is RM149 for solid colours, RM169 for graphic designed ones like mine, then again I believe you're paying for the quality. Think of it this way, would you rather use a cheap case that barely gives your RM2k phone any proper protections, and end up having to pay few hundreds for repair or even more to buy a new one? Or spend a little more for a good, high quality case that gives actual protection that minimises damage, and use your phone throughout its entire lifespan? The available designs on the other hand, are very limited. They have varieties of solid colours, but if you want cute prints on your case, the options are limited and aren't the trendiest (still cute though), to be honest. That's it for my review, and if you would like more information on Otterbox and all the other quality cases they offer, hop on over to Otterbox Asia and give your phone the love it deserves!